Fishabout is a dedicated Fisherman's guide service and travel agent with a simple philosophy; "Best Guides, Best Locations, Best Seasons". Search our adventures by destination or species, and enquire or book with us by filling out our booking/enquiry forms on this site. 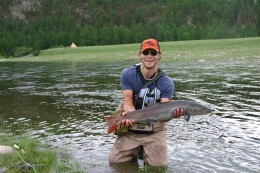 "The guys at Fishabout have been awesome since we crossed paths in early 2012. 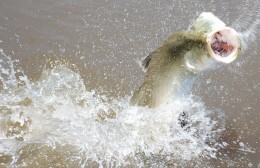 After doing a couple of episodes with them barra fishing at Labelle Downs they've managed to organise some great destinations for the 2013 series. They're good blokes who can provide you with a heap of advice if you're keen to do some fishing travel. This year they've got us venturing throughout the Pacific, with still plenty of local hotspots to look forward to. 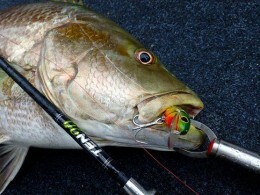 Whether fishing overseas, chasing Barra and more in Australia or simply covering what's on offer in and around Sydney, you cant go past Fishabout." Travel to any destination with Fishabout and take all the hassle out of your trip. You pay no more than organising it yourself, and we provide all flights, transfers, accommodation and insurances to ensure a seamless trip. 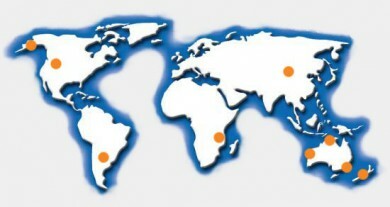 And we can vouch for the quality of every destination we send you to, as we have been there before! 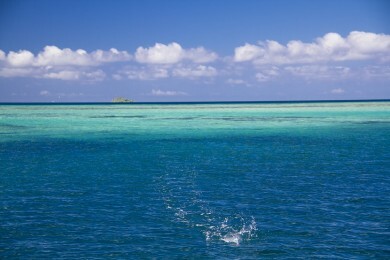 Princess Charlotte Bay, Far North Queensland, is the jewel in Australia's fishing crown. Some of the best and most untouched coral reef, bluewater, and pristine river systems in the country can all be found here. The best way to access Princess Charlotte Bay is by mothership, and there is only one operation licensed to fish it, the luxury 56ft Riviera ‘Reel Chase'. You will be transported to your mothership by R44 or R66 helicopter, flying low so you can take in the stunning scenery of Lakefield National Park, deserted beaches, rugged cliffs and stunning reef you will come across on your 90 minute ride from Port Douglas. 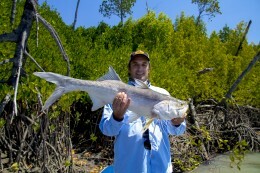 The fishing is absolute world class from chasing down the iconic saltwater barramundi in the Normanby or Kennedy Rivers to the plethora of reef and pelagic fish within close proximity in the surrounding bay and islands including coral trout, sea perch, giant trevally, spanish mackerel a variety of tuna species just to name a few. There are that many options available at your finger tips that the reels will keep on turning. The wildlife of the reefs, islands, headlands and estuary systems provide a visual smorgasbord second to none. PCB is one of the last truly untouched areas left in Queensland. This unique location provides a vast array of landscapes with the variety of wildlife an experience in itself. Sightings of local wildlife are common often spotting dolphins, whales, turtles, dugong as well as some larger than life sharks and salt water crocodiles. Select an option from the list below to go fishing! 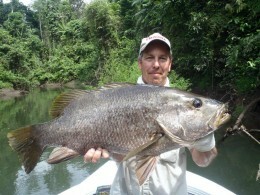 The rivers of West New Britain are renowned for what many rate as the toughest fish with fins, the black and spot tail bass. Uluai Island, a short boat ride off the north coast of West New Britain, is the destination for a new remote lodge, a sister operation to Baia Lodge, which provides the adventure angler with a comfortable base within easy reach of more rivers that hold these brutal piscatorial combatants. 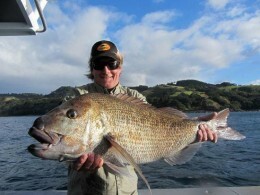 Fishabout packages together the best of New Zealand fishing and a customised selection of other activities to create the Ultimate NZ Snapper and Reds tour. 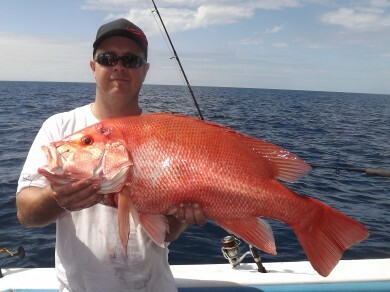 NZ waters are renowned for the being the best place in the world to hook into a Huge Snapper and Yellowtail Kingfish . The Coromandel Penninsua is the epitome of this great fishing, and also offers some of the most scenic views, beautiful wineries, awesome seafood and stunning natural attractions in the world. 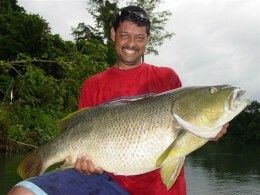 The Fly and Aramia Rivers are situated near Daru, in PNG's Western province. This province is one of the least explored areas of New Guinea, and needless to say, the rivers around here have rarely seen a lure. Due to the lack of infrastructure in the area, the only way to get access to these rivers is by mothership. 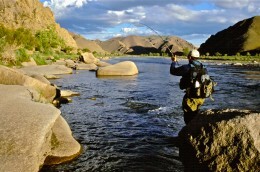 Trips fish either the Fly River or the Aramia River. 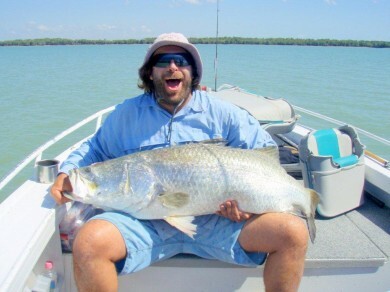 The trip will be spent fishing and exploring river systems mainly targeting Bass, big Barramundi and also Saratoga. The majority of these rivers have not been fished with lures. The fishing is outstanding. The mother ship is very comfortable, it's fully air conditioned, hot water showers and there will be a full time chef on the boat who will cater all meals on board.